There are over 2,000 cataloged arches in Arches National Park. In order to be considered an arch, an opening must measure at least three feet (in any direction). 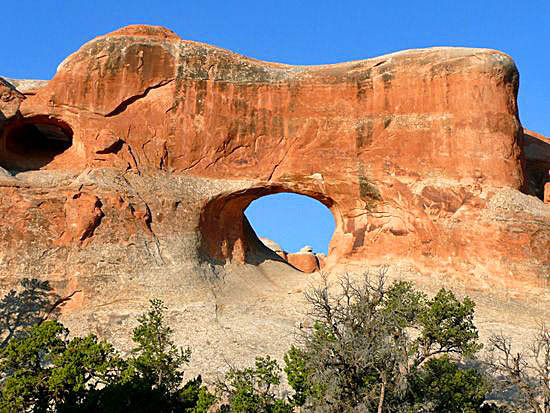 A natural arch or natural bridge is a natural geological formation where a rock arch forms, with an opening underneath. Most natural arches form as a narrow ridge, walled by cliffs, become narrower from erosion, with a softer rock stratum under the cliff-forming stratum gradually eroding out until the rock shelters thus formed meet underneath the ridge, thus forming the arch. Natural arches commonly form where cliffs are subject to erosion from the sea, rivers or weathering (subaerial processes); the processes "find" weaknesses in rocks and work on them, making them bigger until they break through.